The decision was not easy, but now it feels so right and I will never regret it. No phony baloney, this is an authentic choice. Authenticity refers to the truthfulness of origins, attributions, commitments, sincerity, devotion, and intentions. An authentic choice is a decision congruent with doing your best. The words authentic, genuine, real, and veritable all describe actual rather than false or misrepresentation. Other synonyms include accurate, actual, certain, dependable, factual, faithful, genuine, original, pure, reliable, sure, true, trustworthy, trusty, and valid. Opposites include bogus, counterfeit, fake, and phony. Superficial describes a lack of depth or substance. Objects, efforts, and decisions can be authentic, as these examples illustrate. 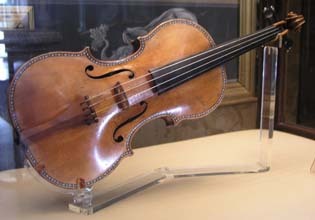 Violins built by Antonio Stradivari , especially those built between 1698 and 1720, are exceptionally valuable. These instruments are famous for the quality of their sound. There have been many failed attempts to explain and reproduce the sound quality. Each of these unique instruments is highly treasured and is typically valued at more than one million dollars. These unique instruments are authentic; they have genuine enduring value. Gutenberg bibles, the Mona Lisa, Stradivari Violins, and the Wright brother's first airplane are all examples of authentic objects. During the 1925 serum run to Nome, Alaska 20 mushers and about 150 sled dogs relayed diphtheria antitoxin 674 miles by dog sled through winter storms across the U.S. territory of Alaska in a record-breaking five and a half days, saving the small city of Nome and the surrounding communities from a developing epidemic. This authentic effort by health care agencies, mushers, sled dogs, and many others is commemorated in the the grueling Iditarod Trail Sled Dog Race. Real estate developer Bobby Ginn set aside about 120 acres—up to $40 million worth of home sites—in his housing community in Port St. Lucie, Florida when bald eagles were discovered nesting there. The land is now preserved as nature in perpetuity by a conservation easement he donated. He has partnered with Audubon of Florida to protect the eagles, and is paying for outreach and monitoring programs out of his own pocket. He recognized that bald eagles are unique and irreplaceable and made the authentic choice to preserve them rather than build more houses. True; Fully trustworthy as according with fact. This includes being representative of the larger context, relevant to the matters in hand, transparent and straightforward, and logically valid conclusions and inferences. Original, not a substitute. Actually and exactly what is claimed. Originating from within. Congruence; agreement, harmony, fit, integration, alignment, consistency, as described. Depth, the closer it is examined the better in looks, more intricate, more subtle, more detailed, more elegant, more interesting. As a result authentic items often hold a unique and enduring value that often increases as time goes on. Authentic feelings. Because emotions are an intrinsic part of human nature, to be true and congruent, authentic choices acknowledge our true feelings. Embrace passion. Symmetry; apparent balance. Acknowledging the dignity of each person requires the equal treatment that can only come from a symmetrical view of the world. This begins with establishing peer relationships rather than power-based relationships. It extends to include empathy, dialogue, respect, reciprocity, and the responsibility to accept blame, apologize, and forgive. Lack of balance often indicates contrived and phony constructs. Doing your best. Anything less does not fully represent the true you. Give your authentic effort. Authentic often unfolds as a profound simplicity is revealed. This is a rich and elegant simplicity that suddenly unifies and strengthens what appeared to be disparate, complex, divergent, inconsistent, convoluted, and chaotic. This authentic simplicity is not shallow, superficial, or simplistic; it is the essential core. So much falls into place and feels right. The authentic alternatives described below provide several examples. What are the authentic alternatives available to us? How can we distinguish authentic from phony? Wise, thoughtful, and deliberate decisions and well-chosen beliefs are more authentic than the foolish decisions made by gullible people. Inquisitive and prudent people use a robust theory of knowledge to choose their beliefs. They are vigilant, scrupulous, meticulous, and diligent. As the issue is investigated more deeply, more evidence supporting it is uncovered. Foolish people are gullible, they fall for anything, and these suckers are easily duped. Obstinate people are unreasonably stubborn. They dismiss or distort evidence that contradicts their arbitrarily chosen beliefs and viewpoint. Self-justification is more important to them than evidence. More through investigation eventually reveals inconsistencies and errors. Beliefs are well founded and based on well-researched and representative evidence. Firm beliefs are authentic, enduring, accurate and helpful. They have endured and been refined by the challenges of skepticism. An assumption is an unfounded belief. Assumptions are unchallenged, unquestioned, unexamined, and very often untrue. Choose evidence over assumption, rumor, innuendo, or speculation. Deductive logic provides rules for drawing valid conclusions from particular premises. The accuracy of the conclusion depends on both the factual accuracy of the premises and the validity of the logic used to draw the conclusion. Inductive logic provides rules for estimating the probability of general conclusions drawn from particular evidence. All other conclusions are invalid and are based on one or more of a vast number of common logical fallacies. Learn to distinguish valid conclusions from invalid conclusions. Only valid conclusions are authentic, the invalid conclusions are bogus. People don't look back over their lives and think “I just wish I had spent more time at the office.” What is important to you? How do you plan to spend your life? What values have you chosen? What goals are you pursuing? What is guiding you? Treat every living moment as precious and spend it wisely and deliberately in meaningful ways, including a balance of time spent: working, relaxing, contemplating, learning, exploring, playing, visiting, bonding, celebrating, planning, reflecting, helping, accepting help, dialoging, walking, exercising, sleeping, and dreaming. Don't waste time drifting among pointless, meaningless, haphazard, or destructive activities. Live deliberately. Express yourself authentically, don't deceive. Practice candor and reject decrees, insults, blather, cryptic exchanges, dry and boring words, and lies. Be reliable. Say what you mean, and do what you say. Become trustworthy and extend trust to others consistent with grace and good judgment. Avoid manipulations—actions taken prior to gaining trust where you try to control others without revealing your intent. Needs are few, simple, often attainable, and richly satisfying. Wants and desires are ever increasing, unbounded, often unsatisfying, and move constantly out of reach. Attain all your needs before pursing your infinite wants. Avoid the greed that leads to endlessly chasing insatiable wants and desires. Reject the insatiable tyranny of more. Instead, appreciate the many aspects of progress that don't rely on growth. There can be more to life than more; know when you have enough. Gratification is that deeply satisfying combination of pride and pleasure that only results from hard work and meaningful accomplishment. Hedonism is the momentary pleasure resulting from various pleasant indulgences. Gratification is difficult, and worth the effort. Hedonism is easier. Balance gratification and hedonism in your life. Know what you can change and accept what you cannot change. Don't stubbornly waste time and energy on futile efforts trying to change what you cannot. Be nimble and change what you can to live consistently with your well-chosen values and goals. Don't be helpless when you can take steps to improve. Don't overreact, don't under react. Recognize the full richness and extent of the humanity we all share. Respect our humanity. Recognize the dignity—the intrinsic humanity and worth of yourself and all others. Each of us deserves to be respected and treated as thou—a fellow human being. No one deserves the dehumanization and disrespect of being treated as it—an object. Measure yourself by who you include, not by who you exclude. Our similarities greatly outweigh our differences. Choose compassion and empathy over hate. Intrinsic motives reflect our most authentic decisions. Exercise autonomy, dismiss introjected regulations, and choose carefully among the extrinsic motives available. Let thoughts, beliefs, words, and actions originate deep from within and be true and secure enough to resist destructive external pressures. The result is a genuine, quiet, deep, vitalizing, serene, and lasting fulfillment and confidence without anxiety, self-doubt, or other sources of stress. Problems exist whether or not we face up to them. You cannot change what you do not acknowledge. Identify the problems that create obstacles to your constructive pursuits and important relationships. Explore and analyze the essential elements of the most salient problems. Confront those problems by identifying them, defining them, analyzing them, and creating constructive solutions. Take action to confront and transcend conflict, don't ignore problems or deny facts. What you do is important. Comparison to others is not important. To overcome the inherent asymmetry of our first-person viewpoint, we must encourage these symmetrical structures in our relationships. Symmetry is the essence of treating others as our equals. Empathy is the first consequence of symmetry; it is the profound recognition that I could be you and you could be me. It is the other awareness that is symmetrical with self-awareness. Empathy is the basis of caring and compassion and the opposite of apathy—a lack of interest or concern. Of the many forms of communications, dialogue is the only symmetrical one. In dialogue we are thinking together, meaning flows freely, and we are learning from the symmetrical contributions and consideration. Dialogue is a form of conversation that is distinct from discussion, debate, distraction, dismissal, delegation, disingenuous, diatribe, and dogma because dialogue is the only form of communication where the participants act as authentic peers. All other forms of communication emphasize a power relationship that interferes with the synthesis, analysis, and interweaving of ideas that characterize dialogue. Dialogue is driven by genuine curiosity and respect rather than by power. Truth and Reconciliation, not Vendettas. How complexity leads to simplicity, by Eric Berlow, TED Talk, July 2010.